You might not think that fad diets and superfoods have much in common. After all, fad diets have a reputation for being flashy and ineffective while superfoods are touted as potent, nutrient-rich powerhouses that can truly revolutionize your diet and your health. Although they might seem to be at opposite ends of the nutritional spectrum, both fad diets and superfoods share one trait: trendiness. Much like today’s favorite diet will soon be replaced by another, the superfood that reigns supreme in the headlines constantly changes. The spotlight shines on a familiar favorite like blueberries before shifting to a venerated veggie like spinach. Then, something more exotic, like açaí, goji berries, or maca powder, captures the imagination and the public’s attention. While the edible that tops the list of superfoods might change, there are some foods that quietly and consistently find a place on the list of foods that you should be eating. Chicken is one of these reliable foodstuffs. If you explore the nutritional value of chicken, you’ll quickly see why it continually earns expert recommendations from nutritionists, dietitians, doctors, and athletic trainers. When considering the nutritional value of chicken, it’s important to look at what chicken provides. Interestingly, it is equally important to take note of what it lacks. As the National Chicken Council reports, 3.5 ounces of roasted chicken breast has more than 30 grams of protein and just 165 calories. Eating a high-protein diet makes it easier to maintain a healthy weight by supporting the body’s efforts to build muscle, firing its metabolism, and increasing feelings of satiety so that you’re less inclined to snack mindlessly. As a bonus, chicken is a whole protein, which means that it contains all of the essential amino acids that the body must obtain from foods because it is unable to produce them itself in sufficient quantities. These amino acids provide the body with the building blocks it needs to repair and rebuild itself, so consuming plenty of high-quality protein is a great way to support your immune system, promote healing, and support recovery. 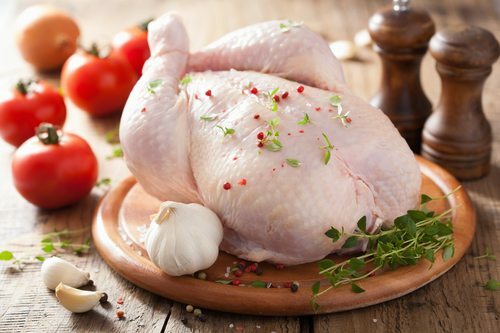 While protein is undeniably valuable, it isn’t the only nutrient of value found in chicken. This lean meat also contains L-tryptophan, an amino acid that plays a role in creating serotonin, a neurotransmitter that helps improve mood, regulate sleep, and facilitate wound healing. In addition, chicken is a good source of vitamin B3 and vitamin B6, nutrients that are vital for your metabolism and immune system. Iron, which is crucial for the production of healthy red blood cells, and zinc, which plays a role in cell growth, cell division, and immune function, are present as well. Chicken also provides phosphorus, a mineral essential for strong, healthy teeth and bones, and selenium, a mineral that contributes to both immune system function and the regulation of thyroid hormones. They say that absence makes the heart grow fonder. When you’re talking about the absence of problematic substances, absence can help you stay healthy as well. Part of the reason that chicken is a favorite of health-conscious people is what it doesn’t have. While red meat is high in cholesterol and saturated fats, substances known to be bad for your cardiovascular health, chicken is different. This lean mean is low in both cholesterol and saturated fats, so it’s a popular choice among people who are trying to eat healthy. Chicken is also a naturally gluten-free food, so it’s a great option for people who are struggling with celiac disease or gluten sensitivity. There are countless healthy dishes that contain chicken, but it’s easy to get into a recipe rut. If you want to enjoy the nutritional value of chicken, but you simply can’t face another plate full of poultry, consider reaching for a high-quality chicken protein power like BarnDad’s Real Clean Protein: Chicken & Egg White Protein Powder. Available in both orange and chocolate flavors, this protein powder can be used to make delicious shakes that provide the perfect mix of nutrition, convenience, and flexibility. Would you like to enrich your favorite recipes by adding protein during the prep? Try using an unflavored protein powder so that it’s easy to incorporate the product into the delicious dishes that you’re craving. Are you eager to power-up pasta, rice, and other dishes? CHXN-Protein Premium Protein Gravy brings both fantastic flavor and notable nutrition to the table. At BarnDad Innovative Nutrition, we thrive on helping our customers embrace healthier lifestyles by providing them with an amazing selection of high-quality foods, snacks, and supplements. Stop by our website today to explore our full range of products.